Perfumed and alluring on the nose - very Pinot, with smoky, sweetish cherry and raspberry fruit. Intense, layered and textured on the palate with luscious red berry flavours and supple tannins. Has a flavour of good Burgundy about it, but with an extra layer of depth and concentration. This is very good pinot indeed, with poise and purity, freshness and balance. In late 1990, a young couple left Auckland behind for a rural village in Nelson, encouragingly named Hope. Swapping city for country life, Andrew Greenhough and Jenny Wheeler took on a four-hectare property, determined to create something of their own. The original vineyard was established in the 1970s by a pioneer amateur winemaker, planted with Cabernet Sauvignon, Gewürztraminer, Müller-Thurgau and Riesling. More than a quarter of a century later, the 4-hectare adventure has expanded to 13 hectares; the Müller-Thurgau is long gone and the vineyards are now certified organic; the majority of their wines are not fined, making them vegan friendly. 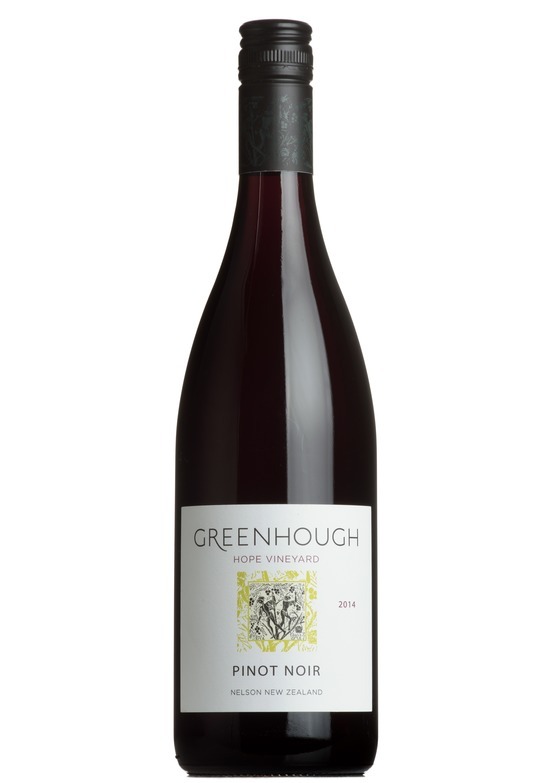 Pinot Noir represents close to half of all Greenhough’s plantings and the Hope single vineyard cuvée produces a concentrated wine with a lovely core of ripe fruit and a fine sinewy conclusion. Sauvignon Blanc accounts for close to one-third of the vineyards, making a more restrained and elegant style than in Marlborough. Fine, pure Chardonnay is joined by the rarely seen non-aromatic variety Pinot Blanc, which offers a silken texture, appetising almond and lemon flavours, and a fine line of acidity. Greenhough also has a tiny parcel of Riesling, including three rows on their own roots dating back to 1976.